VietNamNet Bridge – The Mekong Delta will disappear in the next several decades once Pak Beng Dam and another 10 planned hydropower dams are built on the Mekong River in Laos and Cambodia, delegates warned at a conference on Saturday in the Mekong Delta city of Can Tho. 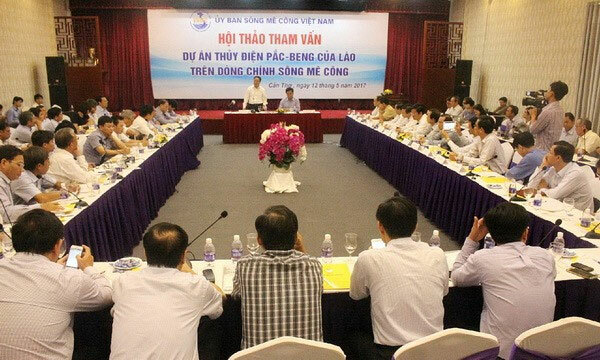 “Viet Nam wants all upstream Mekong River nations to adopt proper policies in exploiting the river, especially in hydropower dam construction, in order to ensure rights for downstream nations, like Viet Nam,” Minister of Natural Resources and Environment and chairman of the Viet Nam Mekong River Commission, Tran Hong Ha, said in his opening speech. “Viet Nam is seriously worried about the increasing exploitation of hydropower in the Mekong River in recent years by upstream nations. Viet Nam has recently suffered severe drought, saline intrusion and land sinking,” he added. “Laos should take additional time for consultation and temporarily delay the construction plan for Pak Beng Dam because all the environmental impact figures of the project are very backward, insufficient and fail to follow international standards,” said Dr Le Anh Tuan, deputy head of the Can Tho University Climate Change Research Institute. “Pak Beng Dam will be built in a region prone to earthquakes. Within 10–20 years, an earthquake measuring 5 or 6 on the Richter Scale could occur, and within 50 years, it would be stronger at 7 on the Richter Scale. It is dangerous to build even one hydropower plant in the region,” said Professor Nguyen Ngoc Tran, former deputy head of the National Assembly’s Foreign Affairs Commission. “Pak Beng Reservoir will keep most of the alluvium and there will be no more for the Mekong River downstream,” said Dr Nguyen Anh Duc, director of the Mekong River Basin Development Support Centre. “With all 11 hydropower dams operating, Chau Doc in An Giang Province will lose 65 per cent of alluvium and the Mekong Delta will disappear,” he added. Additionally, Pak Beng Reservoir is designed to cover 97 square km and the water flow for fish will be so slow that most of the fish will be kept in the reservoir. “The dam will impact daily life of over 33 million local residents in Laos, Cambodia and Viet Nam,” environmental expert Nguyen Huu Thien said. “Viet Nam should prepare scenarios to cope with climate change, sea rising and impacts from hydro power dams on the Mekong River. We should request international support in protecting the Mekong River Delta,” said Nguyen Thanh Hung, deputy chairman of Dong Thap People’s Committee. “There is an urgent need for regional governments to press the pause button on further dams on the Mekong mainstream, to take stock of projects already under construction, to conduct further studies on the transboundary and cumulative impacts of these projects and to re-consider the dangerous approach being taken towards dam development on the lower Mekong mainstream,” said Dr Duong Van Ni from Can Tho University. “Energy development trends in Laos is indispensable because hydropower is the only natural resource for Laos,” Minister Ha added. “To stop construction of hydropower dams is nearly impossible but we should contribute our ideals to limit maximum impact,” he added. The rapid pace of dam development on the Lower Mekong mainstream - including the construction of the Xayaburi and Don Sahong Dams - has ignored calls from Mekong Governments, donors, scientists and concerned communities for further studies, transboundary impact assessments and participatory regional decision-making.